Digging through the mountain of cool upcoming games, we spotted one project in particular that caught our attention, a rather exciting new VR project from some industry veterans with an impressive background. We got to chat to Lightbound Studios about Titan Arena! Can you tell us the origins of Lightbound Studios of how it came to be, and introduce your team? It was 2014 and I was really enjoying my job at Santa Monica Studio where I had been working for many years. However I had started feeling uneasy and my mind would constantly wondering off home to my new born daughter who was just discovering life, to my 7 year old son who kept asking me to play one of the games I had worked on, and to my wife who was counting the minutes for me to get home. Finally in June of 2014, I decided to fly solo and develop a game that my son could play (since everything I had worked on before were rated M games). Thus, Lightbound Studios was born and Star Chasers was its first project. Lightbound remained a one man studio until May 2017 when I joined forces with Young Choi, an old colleague of mine I had met in Santa Monica Studio, and together we started the development of Titan Arena. A few months ago we added another great developer to our team, Kevin Vargas, turning the team into a power trio! Star Chasers was Lightbounds Studio first indie project Get it on iOS or Android! Lightbound Studios previous title, Star Chasers, was a mobile game. 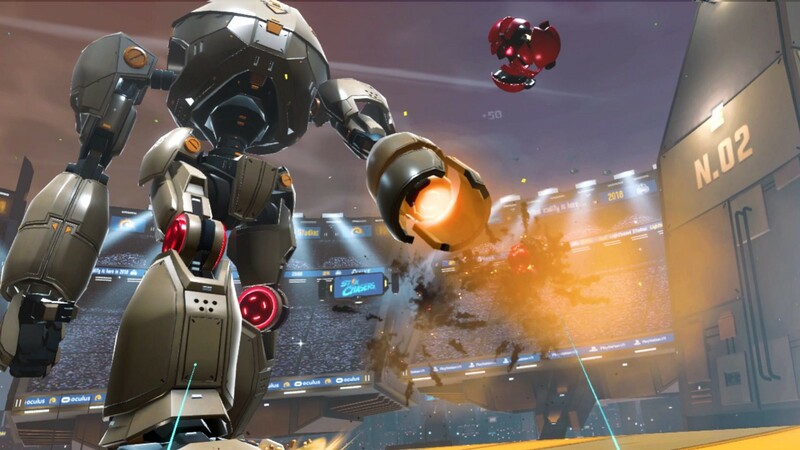 What was the reason for you jumping into the VR space for Titan Arena? I recall the first time I experienced VR was at my good friend Jonathan Hawkins’s home who went on to develop an awesome VR game for Daydream called Eclipse: Edge of Light. It was mind blowing how immersive VR was and the possibilities it offered. It immediately hit me, how incredible it would be to experience, interact, and of course battle larger than life creatures. I pitched the idea to Young and he was totally onboard. A few months later we partnered and started developing Titan Arena. How would you describe Titan Arena and what sort of players are you targeting for it? 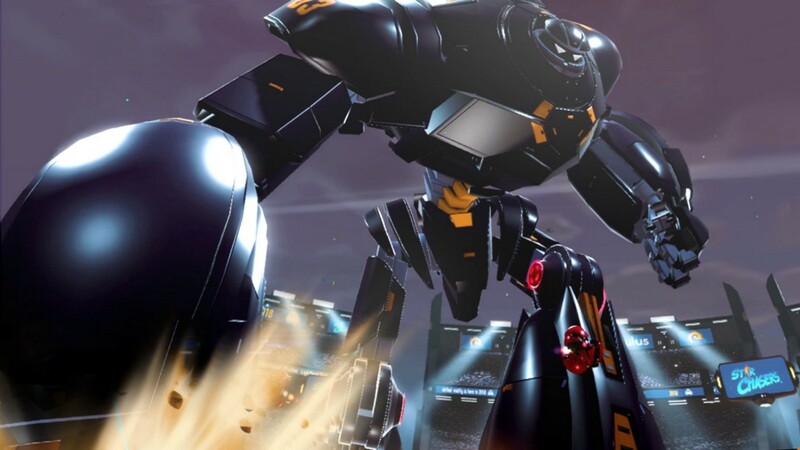 Titan Arena is a first person, fast-paced, VR action shooter where you battle against colossal robots! 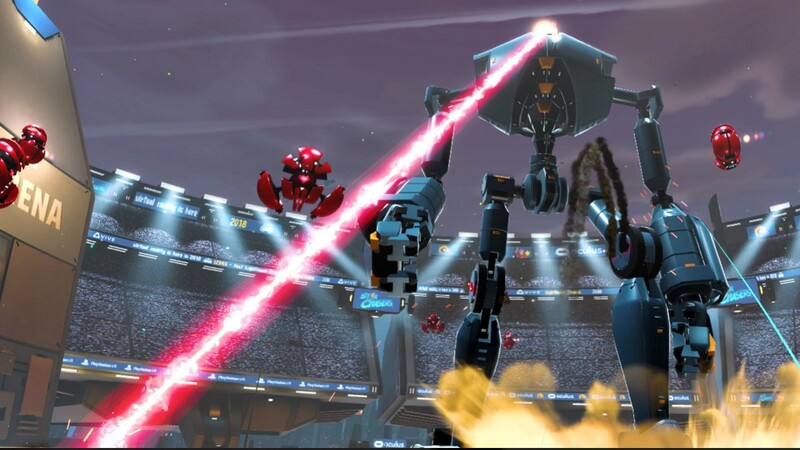 The game is for people who are seeking an adrenaline packed VR game where they get to feel the presence of these enormous robots whose every move can be lethal. Barely escaping their steps or attacks, climbing on top of them, and finding ways to bring them down feels incredibly satisfying. What sort of challenges with VR technology have you been facing? Because in our game you get to climb on top of these titans, one of the biggest challenges was making climbing and traversing the world feel natural and nausea free. Many VR games use teleportation as their primary means of traversal and we started with that as well. But after some feedback we realized that players weren’t too happy with teleportation and they wanted full locomotion. Therefore, we spent a great deal of time identifying and addressing everything that didn’t work well while moving in VR space. We had to learn a bit more about how the human brain works and why it reacts to things in specific ways. We certainly experienced our share of motion sickness until we identified and resolved the factors that contributed to it. You spent many years as Lead Cinematic Animator at Santa Monica Studio, responsible for many memorable moments, can we expect similar epic scenes in Titan Arena? The reason we decided to make Titan Arena was to bring these epic moments into an even more immersive medium where you wouldn’t just watch and interact with these moments but to actually feel it. I think VR adds another layer of immersion that dramatically enhances that epic experience. What are some of the inspiration for Titan Arena? Mechs tend to reference Japanese animes, any influence there maybe? There are certainly both anime and western influences in Titan Arena. Different aspects of the game were inspired by different games, shows and movies that we’ve played and watch over the years. Some inspirations include Iron Giant, Shadow of the Colossus, Gundam, Gurren Lagann, God of War, and I’m sure others that I can’t think of at the moment. You’re currently going through a Kickstarter, any particular reason you decided on this marketing approach? We’ve have been working on the game for a while now and had reached a point where we needed some additional support to build it into a solid experience. We felt that kickstarter was not only a great way to get the additional support we needed but also it would open us to the community giving them the opportunity to provide feedback early on that would help us shape the final product. Being game developers, how much time do you have to sit down and enjoy a game of your own? And what are you playing right now? Unfortunately I get to play very little these days due to time constraints. I have so many games that are either in their shrink wraps or sitting in my steam or Playstation account waiting to be played. The games I recently played are Beat Saber, the new God of War and Overcooked 2. I’m really looking forward to playing Virtual Virtual Reality and Spider-Man…hopefully soon :). Can you let our readers know where we could find more about Titan Arena? We’re also on all the social networks!